Infection with certain types of human papillomavirus (HPV) is associated with various cancers, including cervical cancer. Researchers are working to understand the processes by which HPV can transform a healthy cell into a cancerous one. 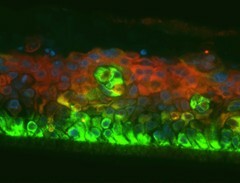 This image shows human ectocervical cells (HEC), growing in 3D air-liquid interface culture. Green color represents cytokeratin 14 (K14), red represents involucrin, and nuclei are shown in blue. This image was originally submitted as part of the 2016 NCI Cancer Close Up project. This image is part of the NCI Cancer Close Up 2016 collection.